In the beginning was the word and the word was Dawkins. Dawkins said let there be a book that explains evolutionary biology to the layperson. The book was called The Selfish Gene and Dawkins looked on it and saw that it was good. Dawkins took the book to all four corners of the Earth, yea even unto the tiniest backwaters of rural America, saying behold I have written a book that explains evolution in such clear terms that even the most feeble-minded and pig-ignorant among you will be able to understand it. And the people said to Dawkins, 33% of us reject your theory of evolution, choosing instead to believe that humans and other living things have existed in their present form since the beginning of time. And the people said furthermore that another 24% believe that a supreme being guided the evolution of living things for the purpose of creating humans and other life in the form it exists today. So a majority of people think your life’s work is worthless drivel. Dawkins was peeved, saying why do you believe such nonsense? And the people said because the Bible tells us so. And Dawkins said do you really believe the Bible when it clearly contradicts the findings of modern science? And the people said yes. Dawkins wailed and gnashed his teeth. Then he went away and wrote some more books. The books were called Ten things I hate about God, 10 other things I hate about God but forgot to include in the first book, and his bestseller Bloody Hell! I’m so angry about God! But the people ignored Dawkins because their faith was strong and unbending and they knew that they would be rewarded in Heaven because God hates evolutionary biologists. And Dawkins said well I may not have persuaded a single one of you unthinking oafs, but I sure have made a lot of money selling all these books. 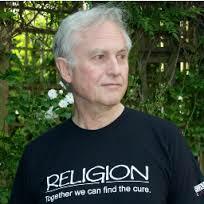 On the seventh day Dawkins rested. This entry was posted in Science and tagged Atheism, Belief, God, Humour, Religion, Science. Bookmark the permalink. A tale of biblical proportions! I’m one of the ones who believes that God created the earth, and Science explains or attempts to explain how He did it. I have no problem with the two co-existing. Ha ha! You are so very funny. I do find though it worrying that most of us refuse to see things in any other way than the one we have been conditioned too. This was awesome! I love “Dawkins wailed and gnashed his teeth” part. And the title is hilarious also. I think, you are right. The whole purpose behind all the brouhaha around religion is just to create publicity and profit from it. Thanks to those who liked it. Please be aware that this is a parable and should not be interpreted literally. No! We will take your text and call it holy and worship it through the coming age… And you shall be our god. This is so funny! Clearly I am not the only one who finds Dawkins rather supercilious!